Is this church in France? Absolutely.This church is in France. It is the church Notre-Dame in Royan. She is 60m high and was completed in 1958, since the original church was destroyed in WWII. Royan is at the Gironde, where we saw such a lot of beautiful pictures in Yves' recent thread. One of the partner cities is Balingen not far from Stuttgart. As a large part of Royan this church is a perfect exemple of the concrete architecture of that we call "style Reconstruction" after WWII. I will have try to narrow it down, could we be in Italy somewhere? No, not Italy, but it is in Europe. Yes it is Mitteleuropa, even Germany, to narrow it down. Somewhere in the Upper Rhine Valley? Not along the Rhine, but with view on a river valley. 1) It is a double castle, consisiting of two different complexes with mostly two different owners. 2) In the younger history it was not possible to visit the place for 26 years. I know it But wouldn't it be unfair because I know you that much? Pauline, your father has almost given it to us. It is surely Brandenburg Castle, Lauchroeden. See http://www.thueringerschloesser.de/e...stle-ruin.html For ruins of that age it is good that the site has been rescued and is now well cared for. You are very correct, Ivy. The castle was closed between 1962 and 1988, because it was so close to the German/German border. A lot of volunteers have founded a community, which is taking care of the buildings now. There are also theater events in summer. The area on the picture is ideal for knight's games. What and where might this be? Come on Pauline, this one you must try! Last edited by wherrygirl; March 17th, 2016, 11:38. Maybe something like scara brae on the orkneys? Good try. Something like, yes, but not the Orkneys. This is a totally wild guess -Birkrigg, The Lakes, Cumbria????? 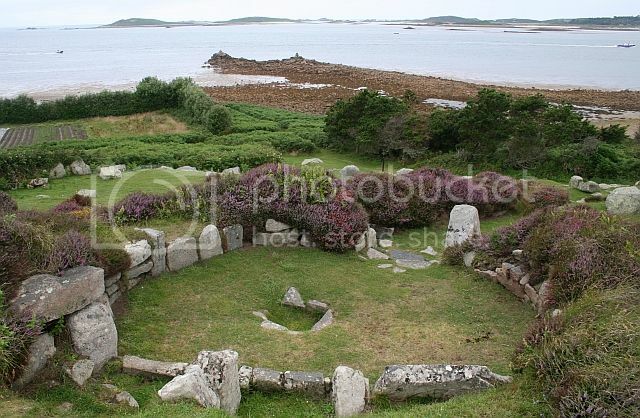 Indented coast, stone rings, garden...I'd say the islands of Scilly???? I was also searching in this area, because of the vegetation it must have been in the South of the British islands.